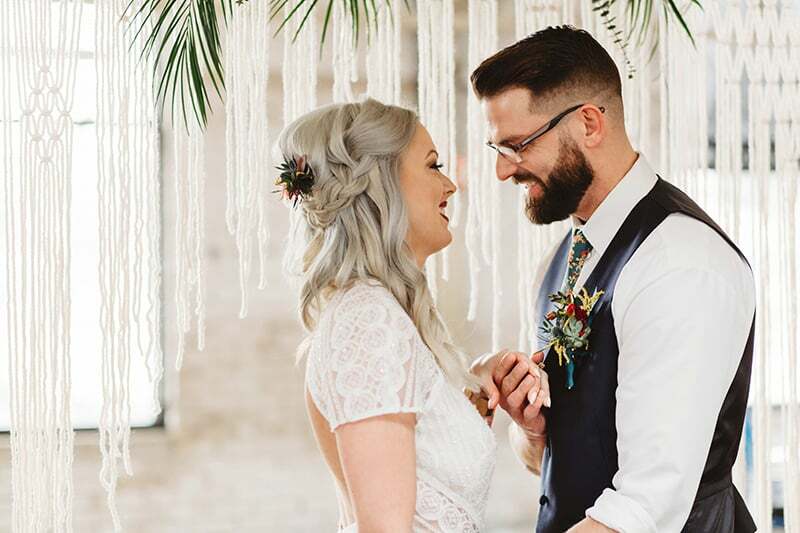 “I wanted to merge a cool bohemian vibe with a fun and playful feel.” Began events designer, Allison. “To accomplish this bright, bold, and beautiful look for your own wedding, you’ll first want to nail down an inspiring color palette! Start by picking out the color that most excites you, then add some gorgeous complimenting colors. If it excites you, it will inspire you! Play around with different combinations, gather images that you find aesthetically appealing, and most importantly, don’t be afraid to use multiple bold colors!! Use your main color (teal in our case) to add some fun to some important elements (i.e. bride’s shoes, groom’s tie and socks, and a pop of bold color in the florals)! ” She explained. “To me, the most important part of your wedding look is that it represents YOUR personality! You don’t have to do what’s trendy, just do YOU and it’ll be perfect!” Allison added.